The most effective teachers understand the fundamental principles of human learning and how to apply those principles to learner-centered instruction. Now that librarians have taken on a greater role in teaching, it is more important than ever to hone up on good, solid research-based teaching and instructional design practices. This is not easy to do without formal training. But a good place to start is a book titled Telling Ain’t Trainingby Harold D. Stolovitch and Erica J. Keeps. 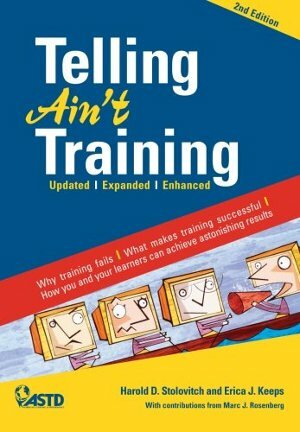 Telling Ain’t Training was created to serve as a how-to manual for developing effective training (or teaching) and instruction based on solid cognitive research. It includes strategies and models for structuring effective training, as well as examples of effective learning activities. It is one of the first books I was exposed to on my journey through the world of instructional design. I highly recommend it for any librarian who teaches, whether information literacy or professional development.